Chili. It seems to be the favored meal this time of the year. And everyone tends to have their own take on chili. Some like it mildly spicy, some like it burning hot. Some like it with lots of tomato chunks, some like it completely smooth. Maybe that's the reason chili cook-offs are so popular, so people can try all the different varieties of chili out there. One of the great things about chili is that I've found it really doesn't matter what you put into it, the chances are it's going to taste great! My dad recently made a chili with spaghetti sauce in it. Surprisingly, it was pretty good! My go-to chili recipe calls for some unique ingredients like cocoa powder and beer. Since I didn't either of those ingredients in the house, I just combined the ingredients I did have and came up with this chunky chili. Mike and I both enjoyed it, and the leftovers were delicious the next day! 1. Brown the ground turkey and drain the fat. 2. Add diced onion and minced garlic and cook until the onion is translucent. 3. Pour the diced tomatoes, tomato paste, kidney beans, and beef broth into your crock pot. 4. Add the meat mixture and chili powder and stir to combine. 5. Cook on low heat for 8 hours. Your Chunky Chili looks awesome, this is a great bowl of chili. 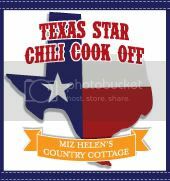 Thank you so much for sharing with Texas Star Chili Cook Off and the very best luck to you! We will just love this Chili! Thank you so much for sharing with Full Plate Thursday. Have a great week and come back soon! Oh Melissa, this looks delicious! YUM!